Rafizi Ramli is at it again on 1MDB, this time taking a swipe at KWAP and the EPF. And sounding unwarranted alarm bells to rile the general public as he did with NFCorp who have in turn initiated a legal suit against him for the lies, distortions and misrepresentations. Added to that, Rafizi faces a conviction on violations of BAFIA. For some quarters, the clarion call is for the Government to throw him into the slammer. We are getting ridiculously delirious, writes lawyer Lukman Sheriff Alias in a Facebook posting. I can’t believe Rafizi is spinning this. 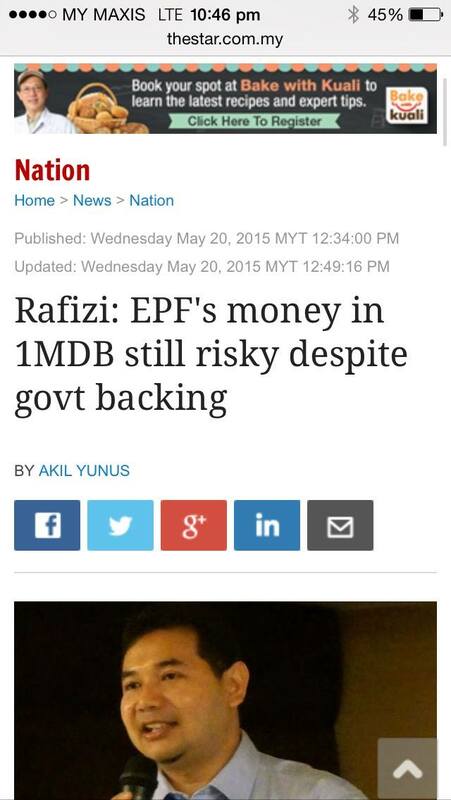 See http://www.thestar.com.my/News/Nation/2015/05/20/rafizi-ramli-epf-investment-in-1mdb-risky-even-with-govt-backing/. It’s a totally irresponsible false and alarmist argument. “….the Board shall invest or re-invest at least fifty per centum of the moneys belonging to the Fund and invested or reinvested during any one year, in securities issued by the Government of Malaysia, provided that the total amount of moneys so invested in such securities at any one time shall not be less than seventy per centum of the Fund’s total investments. Why is there an obligation to invest in government securities under the law? Because it’s the safest investment in a country. All those doing commercial banking transactions know this. From EPF’s perspective, Rafizi’s argument is totally nonsensical. If the government cannot pay the 1MDB debt it surely cannot pay the rest of the government debt is it not? Then where can EPF invest up to 70% of its investments? If they buy other government securities wouldn’t they face the same risk? It would wouldn’t it as it has the same government guarantee risk. So Rafizi wants EPF to withdraw all the money and invest in riskier investment ke? Or simpan bawah bantal je? That is how utterly ridiculous Rafizi’s argument is. It is a scaremongering and alarmist argument with intent to decimate 1MDB. He doesn’t realise that he’s making the situation worse for all of us.